In October last year (2018) we had visitors from Grasshopper Travel stay with us. They created this awesome video and had some nice things to say about us too, which you can check out here. Grasshopper Travel is Australia’s very first video travel guide. You can access thousands of videos presenting great local Australian businesses within the travel, retail, and hospitality industry. They also have international video reviews. These reviews help travellers to make informed decisions on their plans for accommodation, activities, and dining. 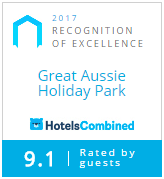 We’re really pleased they came and stayed and enjoyed Great Aussie Holiday Park so much.